Some project sponsors know in advance that they cannot secure the organizational commitment necessary for what they actually want to do. To overcome obstacles, they seek approval for something else that's related, but different and less ambitious. Once that's underway, the organization is "hooked," and they begin expanding the scope of that smaller effort to achieve their heretofore hidden agendas. 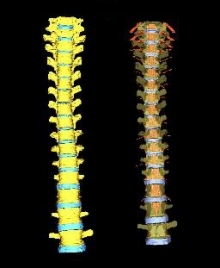 The spine of a human male. One example from nature of probable scope creep is the "mission" of the human spine. The modern prevalence of back troubles and back pain suggests the possibility that what we now ask the spine to do is well beyond its original mission. We're larger than we have ever been, and we carry loads of such a size and in such a manner that the spine is constantly at risk. Some employers insist that employees wear "back belts" as protection, but there is no scientific evidence that they are effective in preventing injury. Photo courtesy U.S. National Library of Medicine. I call this tactic scopemonging and its practitioners scopemongers. Some call these people scope creeps. Sometimes the target of the misrepresentation isn't the project team — it's the owner of the sponsor's budget. When the sponsor is an external customer, as it would be for a contracted services provider, the target is probably a budget owner within the customer organization. But wherever the target is, the team can suffer the consequences, which can appear as pressure, overtime, or long, unpaid extra hours. Here are some indicators that scope creep might be part of a hidden agenda. When a project sponsor seems inexplicably passionate about what seems to be a dull or inconsequential effort, check for hidden agendas. Possibly something more is planned, but it hasn't yet made its appearance. When passion and commitment seem out of proportion to the project at hand, investigate. If you know or can guess what else might be intended, try removing from the team or the project any elements that, though inessential for the stated purpose, might be necessary for the conjectured scope expansion. If no expansion is contemplated, removal of those items should meet no resistance. If the sponsor's or champion's vision doesn't hang together logically, consider the possibility that you aren't hearing the whole story. Ask yourself what the missing pieces might be. Once you know what they are, the vision might indeed make sense. the whole storyIf you suspect that pieces are missing from the sponsor's requests, argue for their inclusion in a "not-requirements" section of the project plan. Once everyone agrees that these items are explicitly out of bounds for this project, any subsequent scope expansion to include these items will be much more difficult. When you first propose a set of not-requirements, you might encounter resistance, which could be evidence of some intention eventually to include the proposed not-requirements as actual requirements. If the discussion occurs early enough in the planning cycle, you might be able to insert the proposed not-requirements as actual requirements, which usually triggers estimation of their costs. The ensuing dialog will likely expose the impractical nature of the items in question. For more about scope creep, see "Ground Level Sources of Scope Creep," Point Lookout for July 18, 2012; "The Perils of Political Praise," Point Lookout for May 19, 2010; "More Indicators of Scopemonging," Point Lookout for August 29, 2007; "Some Causes of Scope Creep," Point Lookout for September 4, 2002; "The Deck Chairs of the Titanic: Strategy," Point Lookout for June 29, 2011; and "The Deck Chairs of the Titanic: Task Duration," Point Lookout for June 22, 2011. Would you like to see your comments posted here? rbrenMRSGgPUSFQpQUfiIner@ChacuVKJoRKiKRoiPaTVoCanyon.comSend me your comments by email, or by Web form. I offer email and telephone coaching at both corporate and individual rates. Contact Rick for details at rbrenuojbEIJokFwNpZkdner@ChacmALvsrbbOiCKrFppoCanyon.com or (650) 787-6475, or toll-free in the continental US at (866) 378-5470.